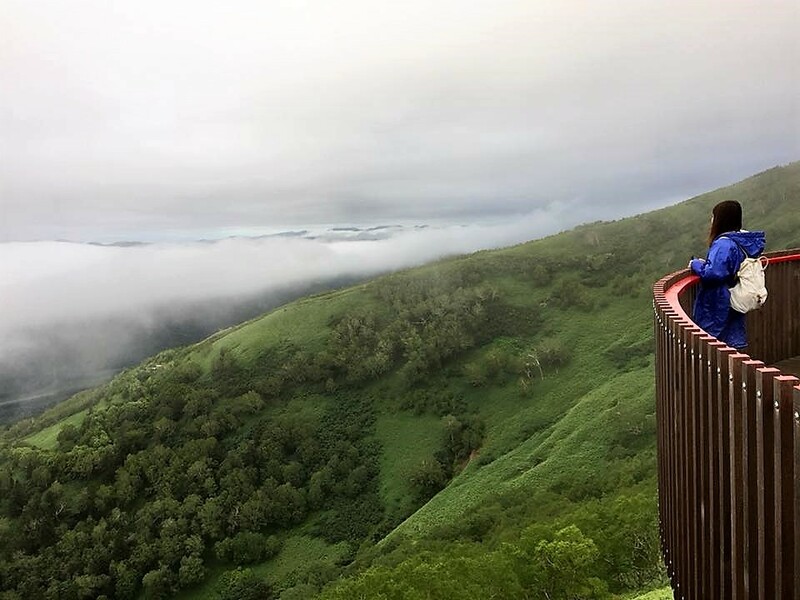 The Unkai (雲海, cloud) Terrace in Tomamu has been gaining popularity in recent years. It is commonly on the itinerary of visitors to Central Hokkaido（北海道）in summer, together with flower fields in nearby Furano（富良野）. 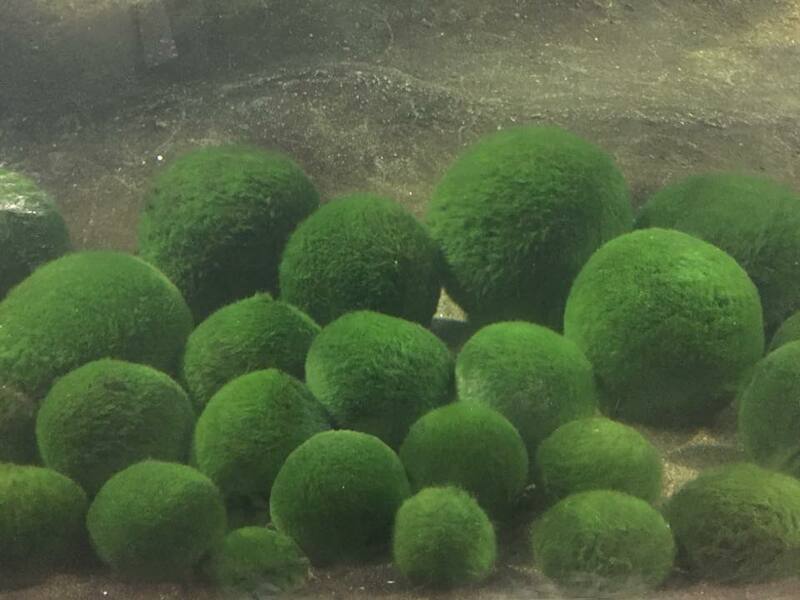 This year, I finally managed to make my first attempt to see the unkai. Seeing the unkai requires much luck and effort. The weather conditions have to be right for the right amount of clouds to form at the right altitude. Also, it is better to reach the terrace early (4+ am). 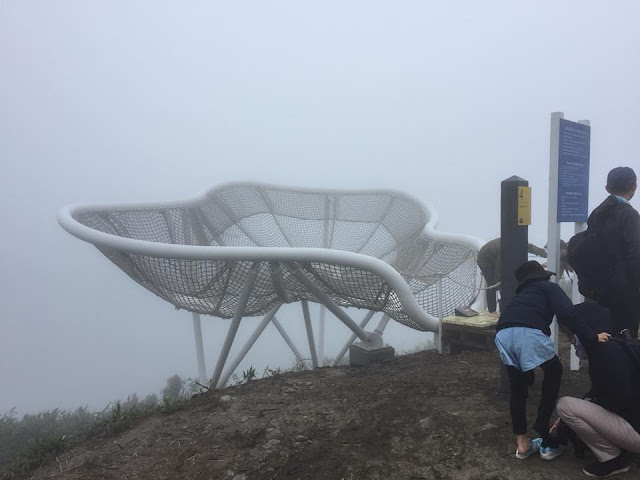 In fact, the gondola to the terrace only operates in the early morning. 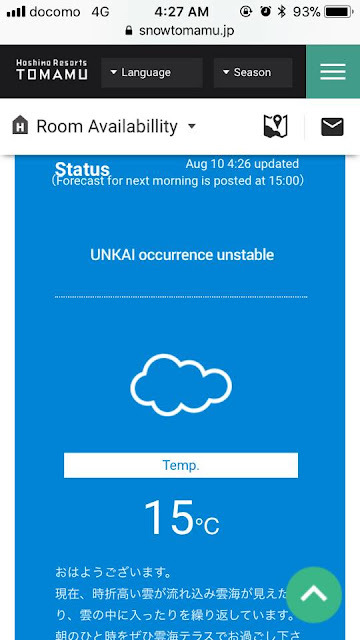 The Unkai Terrace website provides unkai forecast for the next morning at 3 pm, and updates the unkai status slightly before 4 am on the day itself. It also collates the unkai occurences for the past 7 days. According to the website, possibility of seeing the unkai is only 30% to 50%. 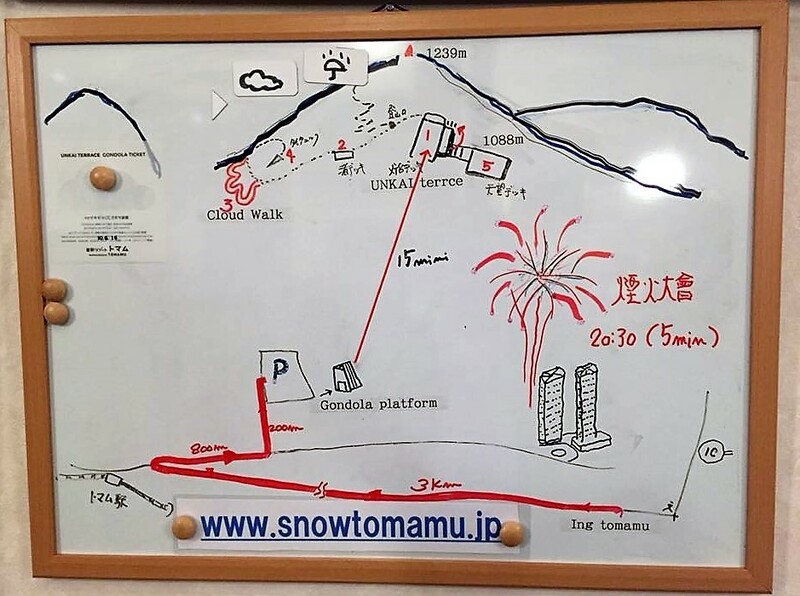 In order to maximise the chance of seeing unkai, we planned 3 nights stay in Tomamu. It is a small resort town with minimal facilities (no convenience stores and petrol kiosk). Due to convenience and lack of other choices, most Unkai Terrace visitors would book their accommodation with Hoshino Resorts Tomamu (operator of the Unkai Terrace). Shuttle bus is provided from the resort to the gondola station. However, we chose a cheaper option- Pension Ing Tomamu, 5 minutes driving distance from Unkai Terrace, since we rented a car (more about this accommodation later). 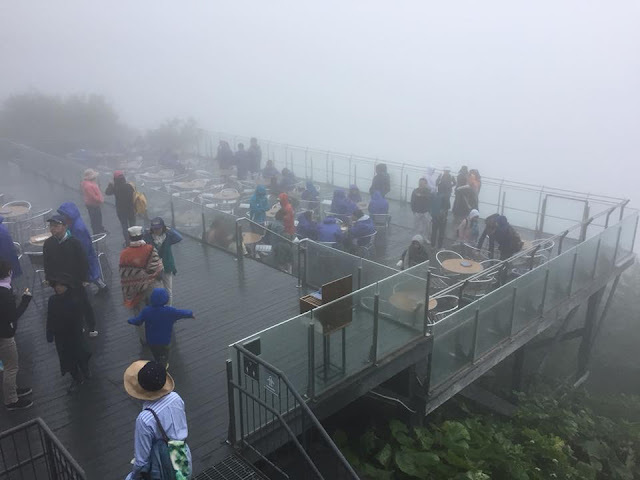 For our first morning, unkai forecast was 30% and it was predicted that the terrace would be "in the cloud". Temperature would be lower than usual (less than 10 degrees Celsius) because of strong wind. 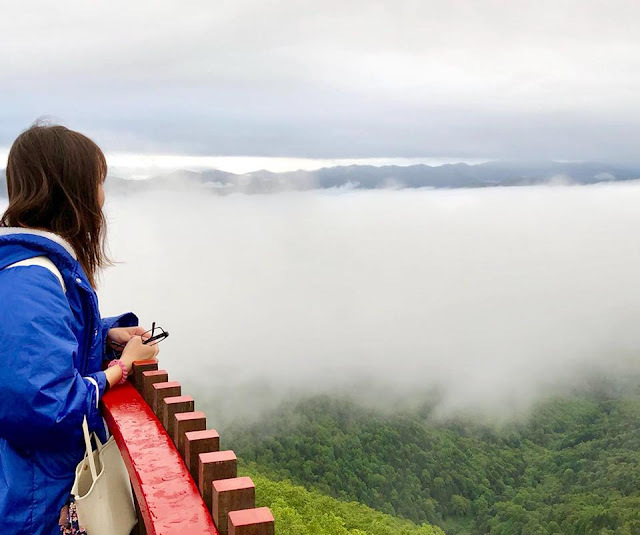 For such cases, it would still be okay to visit the Unkai Terrace (especially for those who are only in Tomamu for one day) to experience how it's like, even though there wouldn't be a nice view as everything would be foggy. At 4 am the next morning, we refreshed the webpage and the terrace was indeed "in the cloud". We still decided to go to the terrace, since weather forecast for the next two days seem to be getting worse, which meant that the gondola may be suspended altogether. It was quite cold up on the terrace. Free jacket rental is available at the terrace for those who came unprepared. There are a few decks to enjoy the view and a cafe to buy beverages and snacks. 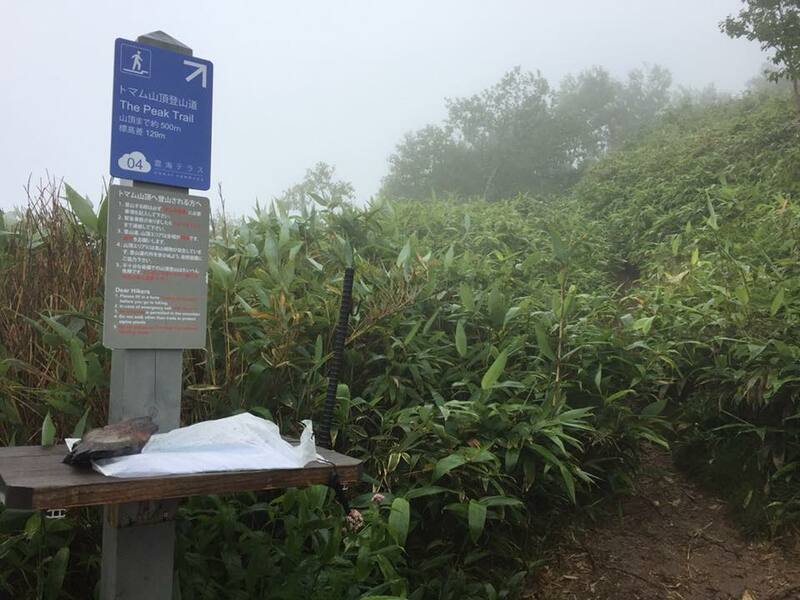 It is also possible to trek higher when weather is good. Excluding the trekking and gondola ride (13 minutes), a visit to Unkai Terrace should take less than an hour. After visiting the Unkai Terrace, we drove an hour to Furano for flower fields, melons, dairy products and wine. 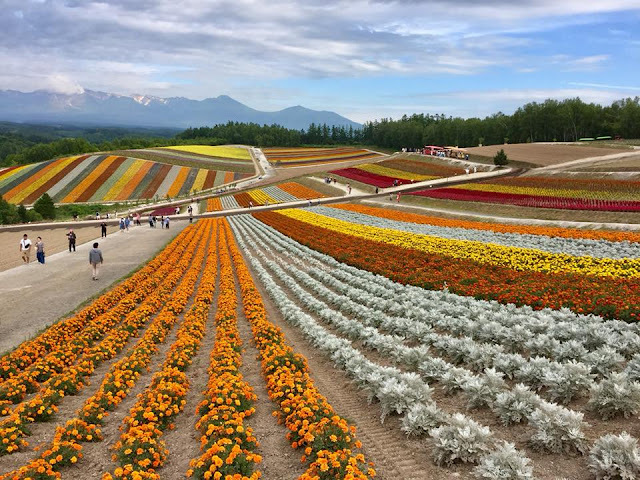 In early August, only late-blooming lavenders remain (Farm Tomita and Kanno Farm), but there are still many other types of summer flowers, such as marigold, dahlia and statice. As we had "trapped" ourselves at Tomamu for 3 nights, we were limited to places within 2 hours drive from Tomamu, as it wouldn't make sense to go somewhere too far and spend most of our time in the car. After considering a few places, we decided to go to Kushiro（釧路）, around 2 hour drive away. 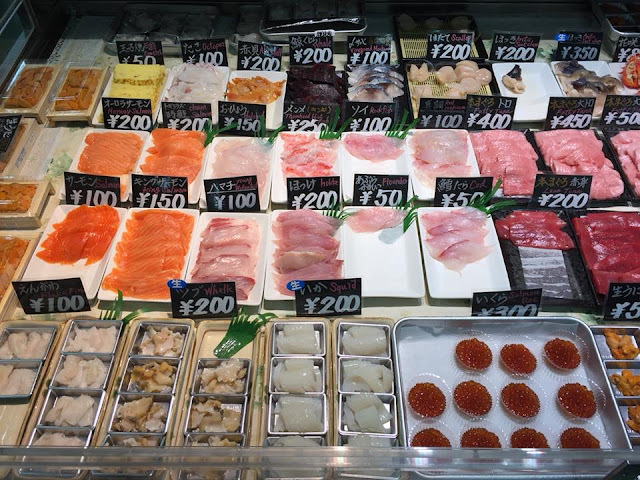 We went to Lake Akan（阿寒湖）and took a sightseeing cruise to see marimo, had good sanmanma (charcoal-grilled mackerel on rice) at Kushiro Fisherman's Wharf MOO and kattedon 勝手丼(choose-your-own-topping seafood bowl) at Kushiro Washo Ichiba (market), then visited Kushiro City Red-Crowned Crane Natural Park for tancho（丹頂）cranes, endangered species that Kushiro is famous for. That night, we checked the Unkai Terrace webpage for next morning's forecast and it was about the same as the previous day. Even though it wasn't unexpected, we were still disappointed. Nevertheless, we set our alarms to wake up at 4 am just to confirm no unkai. The next morning, to our surprise, the status was updated to "unkai is occurring". We were in disbelief! After refreshing the webpage a few times and certain that we were not dreaming, we dashed out of the house in 10 minutes. By around 4.30 am, we were boarding the gondola. After the ride that felt like eternity finally ended, we rushed out to the terrace, and were so glad that the unkai waited for us! We finally saw the view we had been longing to see! However, the clouds were shifting quickly, sometimes blocking the view of the mountain range afar. 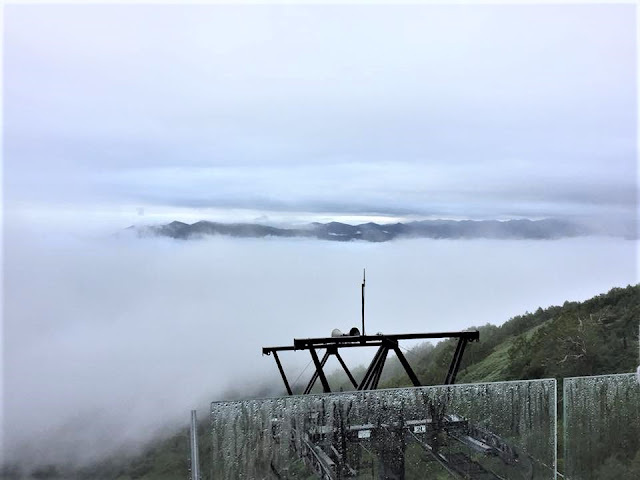 Thanks to the "in the cloud" experience two days ago, we could truly appreciate how it is like to see the unkai clearly, and know where best to invest our limited time for the nicest view- Cloud Walk. At 5.15 am, it started drizzling and everything became foggy. The mountain range could no longer be seen. We decided to leave the terrace as it seemed like we had already caught the best of what could be seen that day. 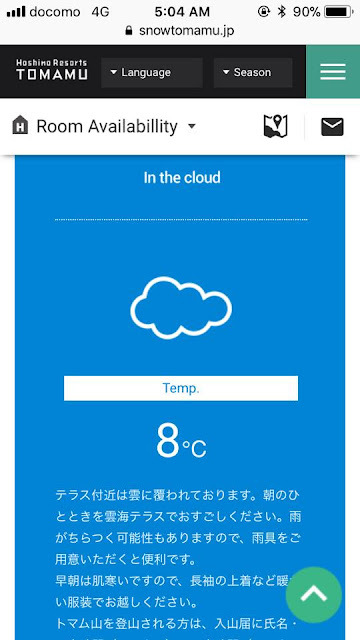 When I refreshed the webpage again upon reaching our rental car, indeed, the status had been updated to "in the cloud". We were really thankful to be able to see the unkai, despite the short duration. I could not imagine reaching there half an hour later, or if we had given up and not woken up to check the status. Also, there was no unkai for the next six days. Time is precious when it comes to chasing the unkai. The clouds are always moving and the movements are hard to predict. If you are lucky enough to see the "unkai is occurring" status, try to reach the gondola station as fast as possible. In other words, get dressed quickly and find an accommodation that is very near to the terrace. 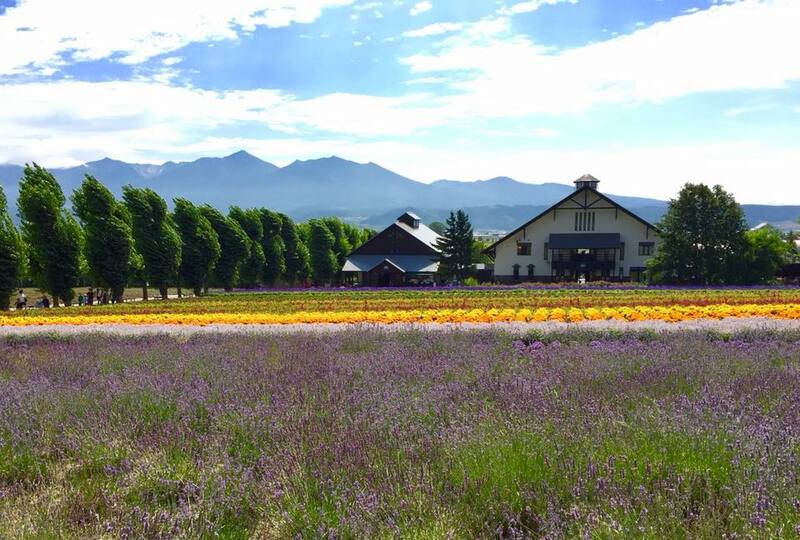 Forget about staying in the Furano region, it's too far. 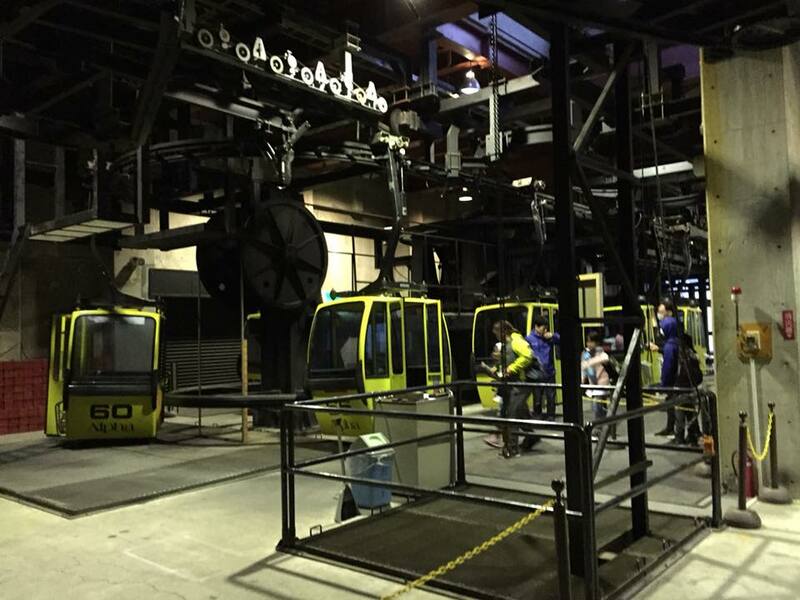 Also, the gondola may start operating earlier than the time stated on the website (which was the case for us). Get ahead of the queue, which may take as long as 30 minutes. For those who do not stay at Hoshino Resorts Tomamu, do not buy gondola tickets (1900 yen) in advance. Few people queue up to buy tickets as most people stay at Hoshino Resorts Tomamu and are entitled to ride the gondola for free. 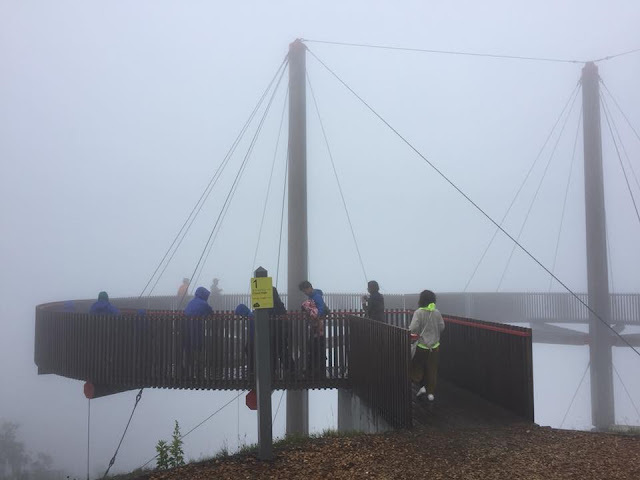 Also, the gondola may be suspended due to bad weather. Never give up hope! It is common to see 20% or 30% possibility the previous day. Always check the status again at 4 am on the day itself. What I saw was "adverse-weather unkai". There are also "Pacific Ocean-grown unkai" and "Tomamu-grown unkai". Regardless of type and duration of unkai seen, it would be recorded as "unkai (has occurred)" on the webpage. Other status would be "cloudy" (in the cloud), "gondola suspended" (extreme bad weather), "sunny" (no clouds) or "rainy" (bad weather). There will be new decks coming up later this year, such as Cloud Bar and Cloud Bed. More information on Unkai Terrace's website. 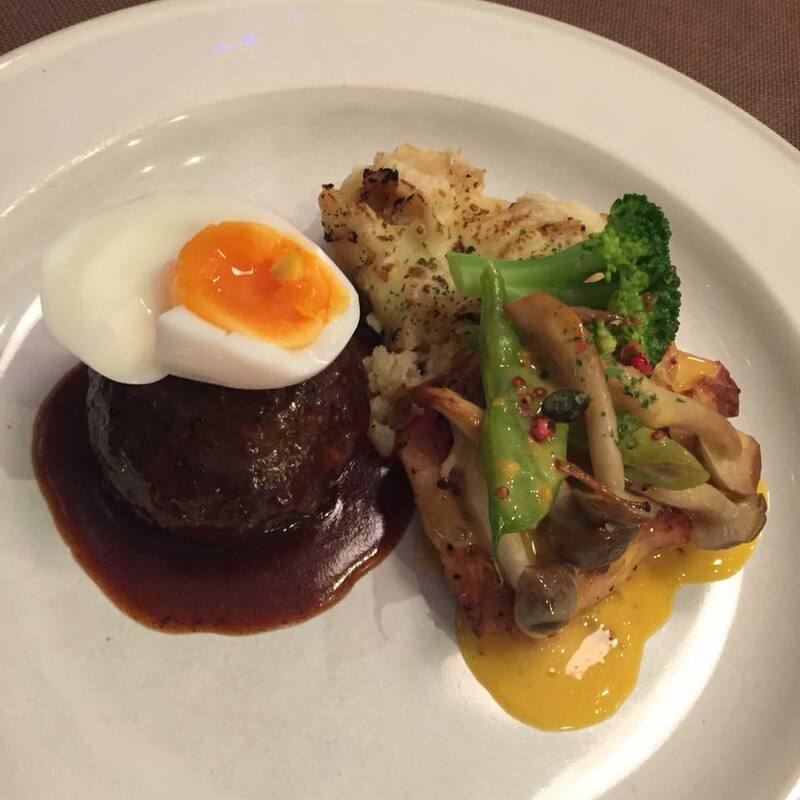 The most common and obvious choice would be Hoshino Resorts Tomamu. Those who drive, are more budget-conscious and are okay with hostel or Japanese minshuku/pension standards may want to consider Pension Ing Tomamu. One room for 2 pax is 17,000 yen per night, inclusive of Japanese-western dinner. We liked the location, food, service and availability of washing machine. During dinner, which starts promptly at 6.30 pm, the owner Natsui-san provides information about the unkai terrace and answers queries from guests. However, toilet and bathrooms are shared and there is a need to pay for gondola tickets. At night, there are fireworks (8.30 pm, lasts for 5 minutes) at Hoshino Resorts in summer. 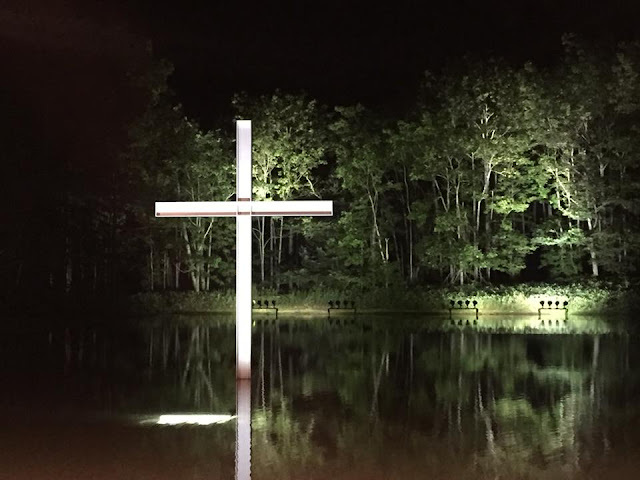 Also, Chapel in the Water by Tadao Ando is open from 8.30-9.30 pm. Of course, there are other places to see unkai in Hokkaido and other parts of Japan. Though in comparison, Unkai Terrace requires less physical effort and regular status updates are provided by meteorologists.